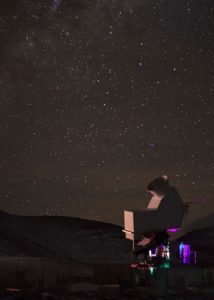 High in the Andes Mountains of northern Chile a unique Johns Hopkins University observatory has just achieved “first light,” the first time the telescope has collected radiation from space. First light came with a series of observations of the moon used to verify the proper operation of the telescope, but the real goals of the Cosmology Large Angular Scale Surveyor (CLASS) telescope are to make a precise determination of cosmic dawn – when the stars in the first galaxies formed – and to characterize what happened in the first trillionth of a second when the universe formed. To realize the goals, CLASS, which was built on Johns Hopkins’ Homewood campus in Baltimore, will observe the oldest light in the universe. Initially appearing as high energy radiation, the oldest light in the universe has cooled with the expansion of the universe and now appears in the microwave part of the electromagnetic spectrum. This ancient radiation called the cosmic microwave background (CMB), was first predicted by Ralph Alpher at the Johns Hopkins Applied Physics Laboratory just after World War II. Its discovery in 1964 resulted in two Nobel Prizes. Three space missions have since been dedicated to the study of the CMB, resulting in two more Nobel Prizes. The CMB is important because it travels through space for 13.8 billion years, carrying with it an image of the infant universe. The most popular current theory of the origin of the universe is called “inflation theory.” Inflation theory holds that the universe grew exponentially from quantum fluctuations to astronomical scales producing gravitational waves. Gravitational waves were discovered very recently from the merging of two black holes. To detect the gravitational waves from inflation will require a very different kind of detector, one that nature itself has provided. Gravitational waves from the origin of the universe induce a specific kind of polarization, or directional pattern of the CMB. That pattern is what the CLASS telescope was designed to observe. The CLASS observatory consists of two 30-foot-tall towers, each holding two microwave instruments. The first of the two towers — using one instrument for now — is operating at the site in Chile, while the second is the Homewood campus being prepared for deployment. The microwave instrument includes optics, a detector system that uses a device designed and recently patented by investigators at Johns Hopkins University and NASA, and a device that rapidly switches the polarization – a bit like switching the direction of polarized glasses. The telescope stands in one of the driest places on Earth – the Atacama Desert – considered one of the best places on the planet for astronomical observation. At 17,000 feet, Atacama’s altitude allows researchers to get above much of the atmosphere, and its location near the equator makes possible a survey of 70% of the sky. The detectors are cryogenically cooled in a custom-designed helium refrigerator to only 0.1 degrees above absolute zero to enable collection of the faint CMB from across the universe. CLASS researchers will immediately start analyzing the information the instrument gathers, and will have to take data for at least a year before they have scientifically significant results. Any publication of results would follow at least six months later. CLASS is led by Toby Marriage, an assistant professor, and Bloomberg Distinguished Professor Charles L. Bennett. Both are with the Henry A. Rowland Department of Physics and Astronomy in the Krieger School of Arts and Sciences. The CLASS research to date at Johns Hopkins has engaged two faculty, seven postdocs, 10 graduate students, and 25 undergraduate students. Other team institutions are the NASA Goddard Space Flight Center, University of British Columbia, Harvard-Smithsonian Center for Astrophysics, NIST, Pontificia Universidad de Chile, Universidad de Chile, University of Michigan, and Villanova University. The National Science Foundation has provided several million dollars for the effort. NASA has funded technological component development grants and provided custom-designed detectors. NIST has provided cryogenic detector electronics. Generous private donors include Heather and Jim Murren, Matt Polk, and Michael Bloomberg. The Comisión Nacional de Investigación Científica y Tecnológica de Chile (CONICYT) has facilitated the CLASS presence in Chile, and a Supreme Decree for CLASS was issued by Chilean President Michelle Bachelet.